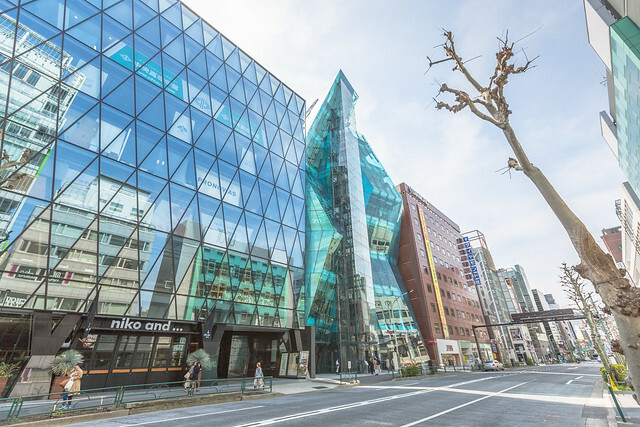 At first glance, visitors to Omotesando may be impressed by the avenue’s vast array of exclusive haute couture brands like Gucci, Prada and Louis Vuitton. It’s a hotspot for fashion and jewelry. 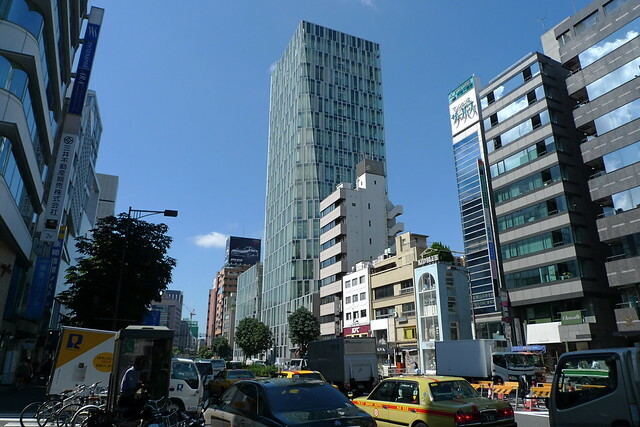 However, despite the shopping-centric nature of this district in Tokyo, it contains some of the most famous architecture in the city. It is sometimes called the world’s best outdoor modern architecture museum. Whether by day or by night, this stretch of road is sure to be a spectacle of modern beauty and style. The architects responsible for the stylized glass facades, sleek angles and carefully crafted support are both famous and award-winning. 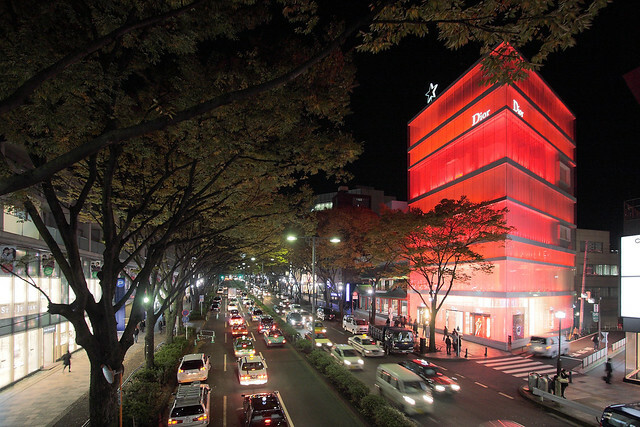 Omotesando is a single neighborhood with more buildings by great modern architects than anywhere else. Many of these designers are laureates of the prestigious Pritzker Prize. In fact, mention the names of these architects to anyone with an interest in the industry, and you will get instant recognition. In the world of architecture, they’re all superstars. While it can be difficult to touch on all the stunning buildings of Omotesando in one place, there are some definite highlights and must-see spots if you’re headed this cool Tokyo neighborhood. Any architecture enthusiast worth their salt would be sadly mistaken to miss out on this famous (and free!) hotspot of modern creativity. All transparent walls and breathtaking angles, this building seems to defy gravity. It is often referred to as “The Iceburg” for its crystalline form and soaring height, and is a sight to behold either by day or by night, when it lights up blue. Three kinds of color-laminated glass enhance the edgy effect of the building shape, making it look like a giant crystal rising up in the middle of the city. Surrounded by roads on all sides, and boasting a whopping 50,000 square-meter floor area, this commercial giant is a 1 block full development, which is a rare case in this district. Its three-dimensional façade is mainly composed of glass, which results in a diverse optical phenomenon derived from transmission and reflection of sunlight. Depending on the angle and the nature of the sunlight at any given moment, onlookers are either able to see into the building, the city is reflected in its walls, or it seems to blend in with the sky itself. 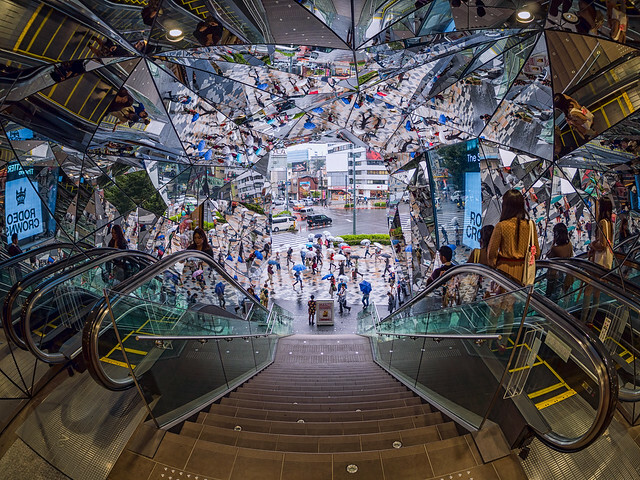 Tokyu Plaza is truly a sight to behold. 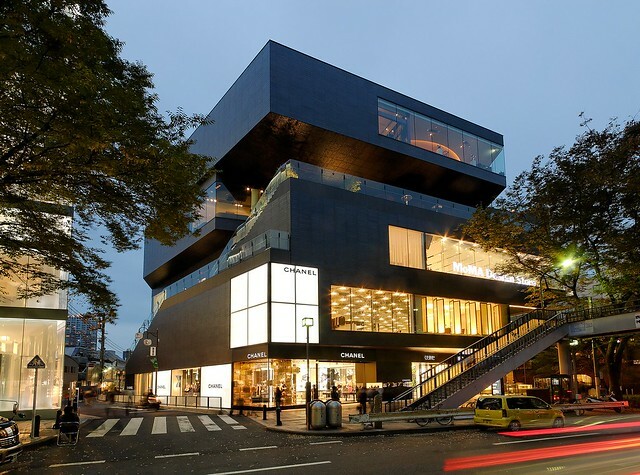 Designed by Herzog & de Meuron, Pritzker Prize-winning architects, Prada’s flagship store in Omotesando is a five-sided, six-story building composed on diamond-shaped glass panes, which vary in nature between flat, concave and convex bubbles. Designed with the intent of “meshing consumption and culture,” the glass panes are described by Herzog as “an interactive optical device. Because some of the glass is curved, it seems to move as you walk around it. This creates awareness of both the merchandise and the city-there’s an intense dialogue between actors.” For these architects, a view of the city is just as important as the merchandise being purchased here. To keep with the theme of Pritzker Prize winning designers, SANAA’s Dior building does not disappoint. Comprised of irregular layers seemingly stacked atop one another, The building’s façade is composed of glass walls set in front of a translucent acrylic screen. Lit up at night, it truly is a spectacle. While fairly straightforward in design, the screen gives a hint at what is inside without revealing too much, and creates a glowing blank canvas for nighttime light shows. The architects admit that while lacking a bit in form, this building serves its function, which is somewhat the opposite of the Prada building: it separates interior from exterior so shoppers can focus on the task at hand while they’re inside perusing. The word “gyre” means “twist” or “spiral,” which is exactly what this edifice appears to do. Each floor is offset from the one below it, forming a unique spiraling promenade. The goal: flow of traffic. As the floors twist gradually around a central core, a series of terraces is formed that open up to the street. Stairs and elevators connect these spaces, creating a twin pair of two vertical terraced facades on each side of the core, one for ascending and the other for descending. We have Netherlands-based architecture firm MVRDV to thank for this remarkable structure. 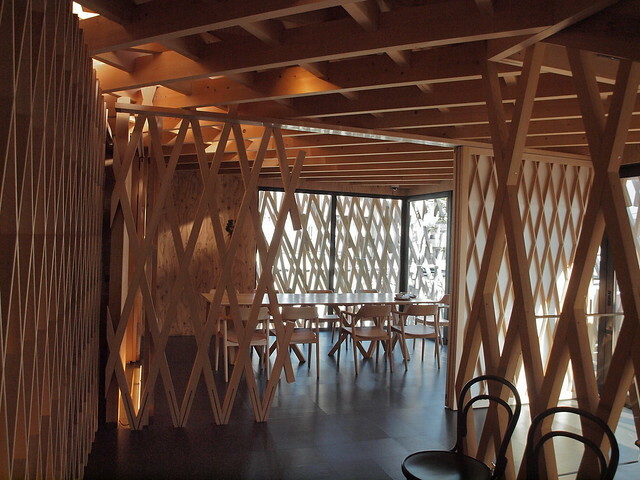 Home to a small shop that sells pineapple cake, this noteworthy building is surrounded by a crisscross of latticework. Over 5000 meters of hinoki (Japanese cypress) were used to create this visual spectacle. The design is meant to reflect the careful preparation of the company’s trademark desserts. The way the light plays off the wooden façade on the inside of the building evokes a feeling of being in the forest. 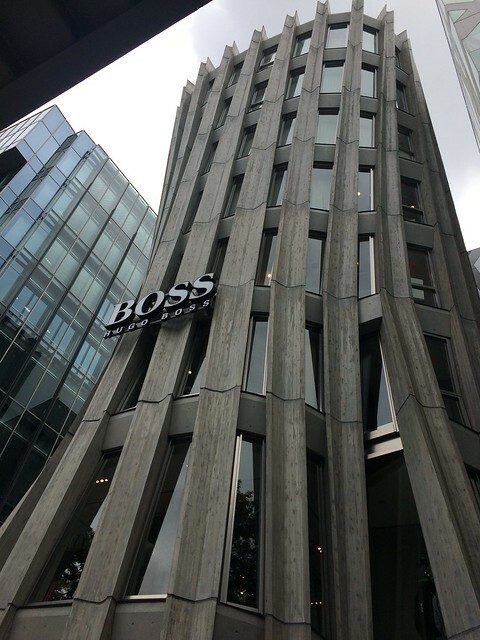 Designed by famous Japanese architect Norihiko Dan, this building is immediately recognizable as one of the most iconic and unique buildings of Omotesando. Resembling the turret of a castle, its hourglass shape and iconic grooved concrete makes this building foreboding, whimsical and fascinating all at the same time. 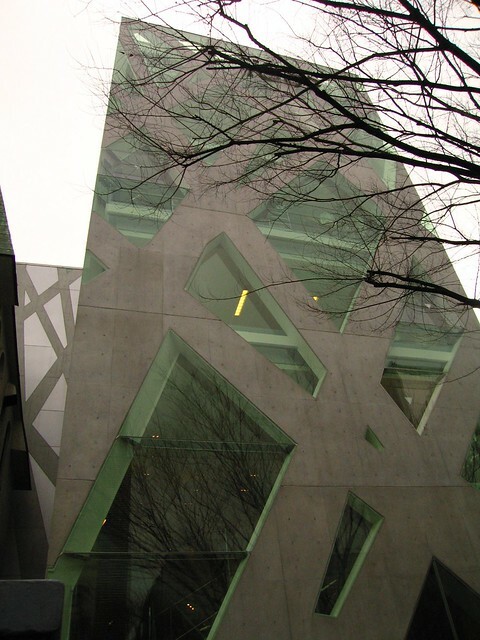 In 2013, architect Toyo Ito won the Pritzker Prize for this one-of-a-kind design. This store’s fractured, matte concrete and glass structure is inspired by the web of tree branches that line the street. Inside, the motif continues, with diamond-shaped walls that lean and list in varied directions. The interior feels very modern, but still warm and comforting. With its insatiable appetite for the new and edgy, Tokyo’s high-style Omotesando is a neighborhood that will astound and delight architecture fans at every turn. Even if you can’t afford to spring for the dizzying prices of the merchandise, you can experience this rare and spectacular game of architectural one-upmanship free of charge. It’s a unique experience you won’t want to miss on your next trip to Tokyo!